Ben Ainslie kept US rival Zach Railey at bay to claim the third Olympic gold medal of his sailing career. 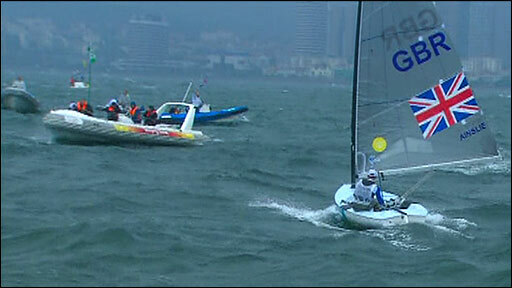 Ainslie, 31, sailed sublimely in rough weather to win the Finn medal race and add to golds from Athens and Sydney. "I've really enjoyed every minute of my Olympic sailing career, I'm very lucky," he told BBC Sport. Ainslie is now Britain's most decorated Olympic sailor of all time, his three gold medals complemented by silver in the Laser class at Atlanta 1996. Ainslie finished on 23 points uin Qingdao, while Railey finished sixth in the medal race to make sure of silver with 45 points, and Frenchman Guillaume Florent won bronze with 58 points. The race was scheduled for Saturday, but it was postponed for 24 hours because of light, unsettled wind conditions. And the start was delayed for nearly two hours on Sunday when strong winds and heavy rain made conditions in the waters off Qingdao too treacherous for racing. When racing did get going, Ainslie took a different approach from the one he used in Saturday's abandoned race. What do you think of Ainslie's achievement? Ainslie had opted to cover Railey in the light conditions, but the Briton threw out his match racing approach in the 16-knot winds to assert his dominance. "It was a bit different today," said Ainslie. "Yesterday the breeze was very light and I couldn't give the US guy any chance to get away from me. "Today I was more confident with my speed against his, and my fitness." Having started well, Ainslie rounded the first mark with a 12-second lead over France's Guillaume Florent. He maintained his lead at the halfway point and was 20 seconds clear by the final mark, with Railey well out of the running in sixth place. The run to the finish became a mere procession for Ainslie as he crossed 13 seconds ahead of Denmark's Jonas Hoegh-Christensen. Afterwards, Ainslie told BBC Sport he is keen to sail at London 2012. "The draw of 2012 and racing on your home waters is huge," he said. "It's a long way away but if I've got a chance to be there and do well, I'd love to do it."